We are delighted to announce the winners of our annual Industry Awards for 2018. The RNA Industry Awards are decided by the membership, with every member eligible to nominate within each category. They recognise and celebrate the many professionals whose work supports and promotes the genre of romantic fiction. Five awards were presented during the our Winter Party, held in the Library at One Birdcage Walk in London. 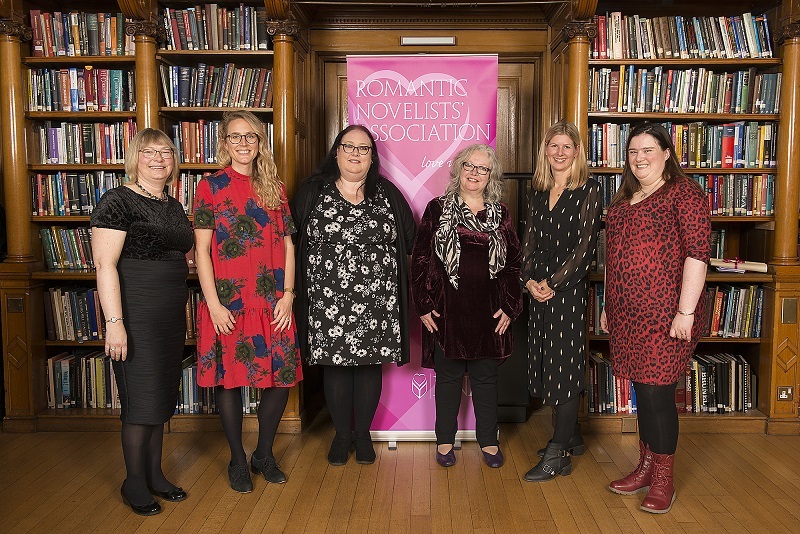 This award recognises the important work that librarians do in supporting the romantic fiction genre, and the Association in particular. The winner was Sharon Hunt, from Kingswinford Library in Dudley, for being committed to supporting and promoting romantic fiction through library events, reviews, and publicity. Runner-ups Will Cooban from Bexley Libraries, and Ben Woodfine from Bedford Libraries, were nominated for their continual support and proactivity, and for bringing romantic fiction events to their region. For the literary agent who has striven to support, mentor, nurture and promote their authors’ careers, the genre in general and the RNA in particular. This year’s winner, Amanda Preston from LBA, was nominated for her championing of romantic fiction and support for the RNA. With a list featuring several authors in the genre, she was praised for being supporting, unfailingly enthusiastic and never afraid to explore new directions. Kate Nash, from Kate Nash Literary Agency, and Juliet Pickering from Blake Friedmann, were joint runners-up. For the publisher who embraces the genre, mentors writers to produce their best work, and is innovative, creative and visionary in the marketing and promotion of Romantic Fiction on every level. This year’s award was accepted by Rachel Faulkner-Willcocks, on behalf of Avon Books UK, for their commercial acumen and their energy, expertise and commitment to the genre and its authors. Runner-ups were Laura McCallen from Canelo, and Emma Capron from Simon & Schuster. A selection of images from the awards presentation is available here.